And, at first, the road to an answer seems equally simple: one must estimate the cost of serving a meal and then confirm that revenue suffices to cover this cost. The federal government uses this type of straightforward comparison of costs and revenues to judge whether the federal reimbursement rate for meals served by the National School Lunch Program (NLSP) and School Breakfast Program (SBP) is adequate. The influential periodic federal School Lunch and Breakfast Cost Study, completed most recently in April 2008, estimated that the national mean cost to provide a school lunch was $2.28 in the 2005-06 school year, which was less than the federal reimbursement per free lunch of $2.51 that year (USDA/FNS, 2008). Perhaps there was even a little change left over. The School Nutrition Association, the trade association for school food service operations, uses a similar straightforward comparison, though, not surprisingly, it reaches a different conclusion. Its September 2008 report, Heat’s On: School Meals Under Financial Pressure, based on a less systematic survey of 45 large school districts, estimated that median costs had risen to $2.92 for the 2008-2009 school year, while the federal reimbursement per free lunch had risen only to $2.78. Especially when one considers the growing public pressure to provide better and more nutritious food, these estimates imply a painful financial shortfall. Yet, neither of these comparisons of costs and reimbursements can answer the original question. First, there are diverse ideas about what is a “healthy” meal. To qualify for the federal lunch and breakfast programs, meals are expected to provide foods from multiple food groups and to meet general nutrient guidelines. In many local districts, school food programs face rising expectations for quality and nutrition characteristics that exceed federal minimum standards. Second, the economics of school food service are both more complex and more fascinating than these simple comparisons allow. Think of a school food service operation as a business. It is a not-for-profit business, in the sense that there are no dividends for private shareholders or owners. Yet, most school food services are required to break even, so the economic pressures are very similar to those facing any business. The business has many products to sell. The free federal lunches for low-income children, whose reimbursements were summarized above, are just one fraction of this business. Within the NSLP, the school food operation also serves reduced-price lunches for moderate-income children and “paid” lunches for children from better-off families. The “paid” lunches are still federally subsidized to some extent as long as the meal meets the requirements of the federal lunch program the school food service gets to set its own price for the meal. Meanwhile, the school food service also sells a la carte items, trading off the loss of federal subsidy against the advantages of being able to sell more desirable or profitable products that would not qualify as a reimbursable meal. Then, many school food services offer a federally subsidized School Breakfast Program and a whole array of unsubsidized products through sales to teachers, snack bars, vending machines, and, commonly, a catering business for school events that offer food. In each of these business lines, the school food service faces a different consumer demand curve (the economist’s tool for explaining how sales will respond to changes in price and other factors), a different menagerie of competitors, and a different library of external rules and non-economic pressures. In some school districts, the vending machine line will be a small monopoly for the school food service director, while in others the school food service director must compete with vending machines set up by coaches or administrators, who use them for additional program revenue. In some districts, the school food service will provide the only lunches for sale at high school, competing only with bagged or boxed lunches from home, while in other districts an open-campus policy will require the school food service to compete with nearby stores and restaurants for lunch sales. Some school districts have strong rules about the nutritional quality of “competitive foods”, a catch-all term for all food and beverage lines that compete with the federal meals programs, while other districts have little regulation beyond a very mild federal requirement about “foods of minimal nutritional value” which prohibits sale of a very limited group of treats, only during meal time, and only in the vicinity of the cafeteria. Any successful business must understand the economic interactions across its product lines, but these interactions are particularly intense for a school food service. A child who consumes a reimbursable lunch and breakfast will have lower demand for a la carte items, while a child who skips a real meal may be hungrier for a snack. This interaction means that school food service decisions about competitive foods strongly affect the federal school meals program, and vice versa. The simple cost and reimbursement comparisons at the start of this article essentially suppose economic success depends primarily on having the federal reimbursement exceed an average cost per reimbursable lunch. However, the school food service’s success really depends jointly on the economics of serving free reimbursable meals, partially subsidized reimbursable meals, and the competitive food businesses. If the subsidized meal program brings in comparatively high net revenue per student, then a school food service director has a strong incentive to maintain sales in the subsidized program, proceeding cautiously with any reforms that threaten the student appeal of the meal. On the other hand, if the competitive foods bring in comparatively high net revenue per student, then, paradoxically, efforts to improve the appeal of the subsidized lunches could harm the bottom line of the school food service as a whole. The School Lunch and Breakfast Cost Study II gives a preliminary indication of the cross-subsidization patterns on average. In contrast with school lunches, the average federal reimbursement for a school breakfast was insufficient to cover the average cost. Meanwhile, although the reimbursement for “free” lunches exceeded the costs, the average revenue for “paid,” only partly subsidized, lunches was below the cost of producing the meal. More surprisingly, the report found that revenue from a la carte or nonreimbursable sales was insufficient to cover the costs on average. Moreover, these averages tell only part of the story. Figure 1 shows the best known statistics from the federal School Lunch and Breakfast Cost Study II, including average costs of $2.28 and a federal reimbursement of $2.51 per free lunch. The figure also shows a striking diversity across districts. 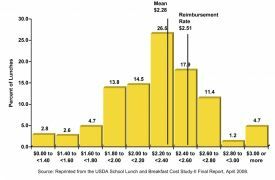 About 24% of free lunches cost less than $2.00, far below the reimbursement rate, suggesting that the free lunch program in some districts may in effect cross-subsidize other business lines for the school food service. At the other end of the spectrum, about 17% of free lunches cost more than $2.60, suggesting that the free lunch program effectively is subsidized by other sales. Some school food services earn higher profits at the margin by promoting a la carte sales at the expense of reimbursable meals, while others earn more by strongly backing the federal lunch program. If we think of the school food service as a business, we need to understand the costs and revenues for different food and beverage offerings, and to understand how nutrition quality improvements affect both costs and revenues. Surprisingly, there is promising evidence to suggest that more healthful choices can be provided while costs are kept in check. According to the results of the California-based Linking Education, Activity and Food (LEAF) program, increased costs associated with greater fruit and vegetable purchases, packing, and storage were offset, in large part, by increased meal sales and other measures that increased the efficiency of the food service operation (Woodward-Lopez et al., 2005). An important concern with this approach is that it may require capital investment in the beginning. A case study of the Hopkins School District 270 in Minnesota demonstrates this point nicely (Grainger, Senauer, and Runge, 2007). This school district completely overhauled its school food service program after 2003: they opened a Health Nut Café, which served foods free of trans-fats and high in fiber with low levels of sugars; they removed the soda from the vending machines and replaced it with water and 100% juices; they switched to low-fat salad dressings and cheese, and whole wheat breads and pizza crusts; and they added more vegetables to many dishes. These more nutritious foods were prepared from scratch on-site, making the shift from the previous practice of simply warming the food prior to service. While the Hopkins food service program was able to remain financially viable, it would have been impossible to get up and running without a significant capital expenditure at the beginning. Most schools do not have the tools necessary to prepare healthful foods. They need an initial investment to improve the kitchen equipment so they can shift from simply heating foods to preparing meals from scratch. Additionally, they need money to train school food service workers to prepare more healthful meals. The LEAF program emphasizes this point. The program awarded grants of approximately $200,000 over a 21-month period to 16 middle and high schools in nine California school districts in order to pilot test the implementation of stricter nutritional standards for both meals and competitive foods. The evaluation indicated that capital expenditures for food service equipment was one of the primary uses of these grant funds (Woodward-Lopez et al., 2005). The need for capital investment was addressed in the American Recovery and Reinvestment Act of 2009 (ARRA), which was signed into law by President Obama on Feb. 17, 2009. The ARRA provides a onetime appropriation of $100 million for equipment purchase assistance to school food authorities (SFAs) participating in the NSLP. As stipulated in the ARRA, priority will be given to SFAs for equipment for schools in which at least 50% of the students are eligible for free or reduced-price meals (USDA, 2009). In addition to costs, the business must consider how healthier meals might affect revenues. School cafeterias will not be able to stay in business, no matter what the reimbursement rate, if students do not choose to purchase the food offered in the cafeteria. While many believe that students will not be willing to purchase nutritious foods, there is evidence to suggest otherwise. In 2005, the USDA released a report entitled Making It Happen! School Nutrition Success Stories. This report included case studies of 32 schools and school districts that have made innovative changes to improve the nutritional quality of their food programs. One of the overarching conclusions from the report is that students will buy and consume healthful foods and beverages—and schools can make money from healthful options. Of the 17 schools and districts that reported sales data in the report, 12 made more money and four made the same amount of money after making nutrition improvements (USDA, 2005). That was certainly the case at the Hopkins School District 270 in Minnesota where they noted a steady improvement in the nutritional quality of students’ food choices. An analysis of their sales data revealed that students were clearly making healthier choices in April 2005 than they were in November 2004 (Grainger, Senauer, and Runge, 2007). This finding comes with one caveat: it appears that there may be a period of decreased revenue while students make the transition to the more healthful offerings. At the Byfield Elementary School in Bristol, R.I., one of the schools highlighted in USDA’s report titled Making It Happen!, income from the new “wholesome snack” a la carte items did decrease $5 to $10 per day during the first year they were introduced; however, second-year sales recovered, and average daily revenue increased slightly above original levels. These new sales levels were maintained through year three (USDA, 2005). Finally, to understand school food service as a business, one must pay attention to the competitive environment. The adequacy of the reimbursement rate for the National School Lunch Program depends in part on the nature of the NSLP’s competitors. Every day students have the choice of what to buy for lunch. In addition to the menu offered from the NSLP, they have the option to purchase food from a school store or vending machine, to buy one or more a la carte items, or—if they go to school on an open campus—they could choose to go to a nearby food vendor (e.g., fast food establishment) to purchase lunch. Only one of the choices mentioned is likely to provide a nutritious meal. School meals must meet nutrition standards in order for a school food service program to receive federal subsidies. In contrast, foods sold outside the meal programs (i.e., competitive foods), including those sold in vending machines, a la carte lines, school stores, snack bars, and fund raisers, are not required by the USDA to meet comparable nutrition standards (MAHK, 2007). Policies to limit access to competitive foods may impact the financial viability of school lunch programs, and ultimately affect their ability to offer more healthful selections. Studies have noted that as income from a la carte sales increases, student participation in meal programs decreases (USDA, 2005). The severity of this was illustrated in a 2003 survey of all 1,256 school districts in Texas. The survey, conducted by the state’s Department of Agriculture, found that sales of competitive foods resulted in up to $60 million in lost income from school meals (USDA, 2005). The LEAF program fiscal impact report reinforces this point, finding that the greatest meal revenue increases were seen in sites that completely eliminated a la carte food sales (Woodward-Lopez et al., 2005). Additionally, open-campus policies seem to pose a significant threat to the financial viability of the NSLP. A 2008 USDA report on the background, trends, and issues of the NSLP cited an open-campus policy as a characteristic that contributed to a school’s difficulty in maintaining net income from their school food service business (USDA, 2008). This evidence suggests that strict rules for competitive foods and access to off-site restaurants during the school day can play an important role in helping school districts meet nutrition quality goals while simultaneously satisfying the economic constraints of the school food service business. Reviewing school food service as a business offers insight into what policies could facilitate a healthier school environment. This review suggests that there may be multiple strategies to enable school food services to improve their offerings without violating their economic constraints. First, and most obviously, with a higher reimbursement rate or greater local subsidies, schools could better afford appealing, healthy foods even in those circumstances when they are more expensive. Second, with money for capital investments, it may be possible to improve nutritional quality and taste even at a constant per-meal reimbursement rate. But, these are the easy remedies. Hoping for additional resources is like wishing the harder challenges would just go away. In the likely case that additional resources are limited because federal and local governments face continued severe budget constraints, school districts may consider measures that protect the federal meals programs from less healthy competition. Through local wellness policies, districts can establish rules about the nutritional quality of competitive foods and a “closed-campus” policy that limits competition from nearby restaurants and convenience stores at lunch time. Because of the interactions across business lines, such policies can improve the economic feasibility of serving healthy meals through the federal programs themselves. These limitations on competitors may seem like a strange policy prescription. Who ever heard of an agricultural economist tacitly endorsing limitations on consumer choices? Certainly, the nutritional and economic advantages of such policies must be weighed against the real welfare value of allowing children to express their own food preferences at school, as they do outside of school. The Just and Wansink article in this theme warns against unintentionally increasing the appeal of unhealthy products by banning them outright. Nevertheless, placing some reasonable limits on competitive food is not really economic heresy. For centuries, economists have admired markets as a coordinating tool for economic decisions in communities composed of households, but economists have always acknowledged beneficent non-market decision-making within households. Schools are not marketplaces but educational institutions responsible for the welfare of their charges. If schools are expected to respond to the current epidemic of childhood obesity by improving the school food environment, and taxpayers are reluctant simply to provide more resources, then there is some merit in considering measures to enhance the relative competitive position of healthy meals served through the National School Lunch Program and School Breakfast Program. Grainger, C., Senauer, B., and Runge, C.F. (2007). Nutritional improvements and student foods choices in a school lunch program. Journal of Consumer Affairs, 41(2). Massachusetts Action for Healthy Kids (MAHK). (2007). Massachusetts a la carte food and beverage standards to promote a healthier food environment. Available online: http://www.maclearinghouse.com/PDFs/Health&Wellness/MA_Food_Standards.pdf. Ralston, K., Newman, C., Clauson, A., Guthrie, J., and Buzby, J. (2008). The National School Lunch Program: Background, Trends, and Issues, ERR-61, U.S. Dept. of Agriculture, Economic Research Service. U.S. Department of Agriculture. (2009). 2009 Equipment Assistance Grants for School Food Authorities. Available online: http://www.fns.usda.gov/fns/recovery/memos/SP_18-2009_sa.pdf. U.S. Department of Agriculture, Food and Nutrition Service (USDA/FNS). (2008). School Lunch and Breakfast Cost Study – II, Final Report. April 2008. Available online: http://www.fns.usda.gov/oane/. U.S. Department of Agriculture, Food and Nutrition Service, United States Department of Health and Human Services, Centers for Disease Control and Prevention, and United States Department of Education. (2005). Making it Happen! School Nutrition Success Stories, January. Available online: http://www.fns.usda.gov/TN/Resources/makingithappen.html. Woodward-Lopez, G., Vargas, A., Kim, S., Proctor, C., Hiort-Lorenzen, D.-L., and Crawford, P. (2005). LEAF Cross-Site Evaluation: Fiscal Impact Report, Center for Weight and Health, University of California, Berkeley. Available online: http://www.cnr.berkeley.edu/cwh/activities/LEAF.shtml. 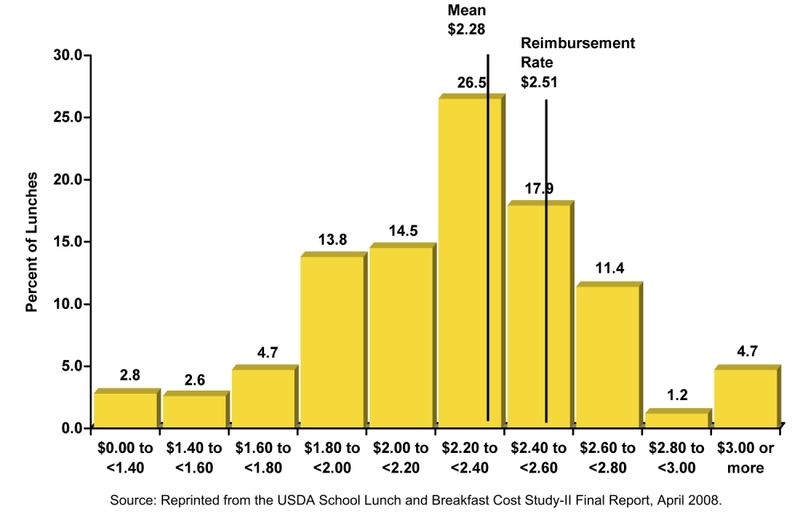 Distribution of Lunches by Reported Cost per Reimbursable Lunch. Parke Wilde (parke.wilde@tufts.edu) is an Associate Professor and Mary Kennedy (marya.Kennedy@tufts.edu) is a graduate student in the Friedman School of Nutrition Science and Policy at Tufts University, Boston, Massachusetts.